Waze is the new navigational tool for drivers in Costa Rica — the land without address systems and limited signage. 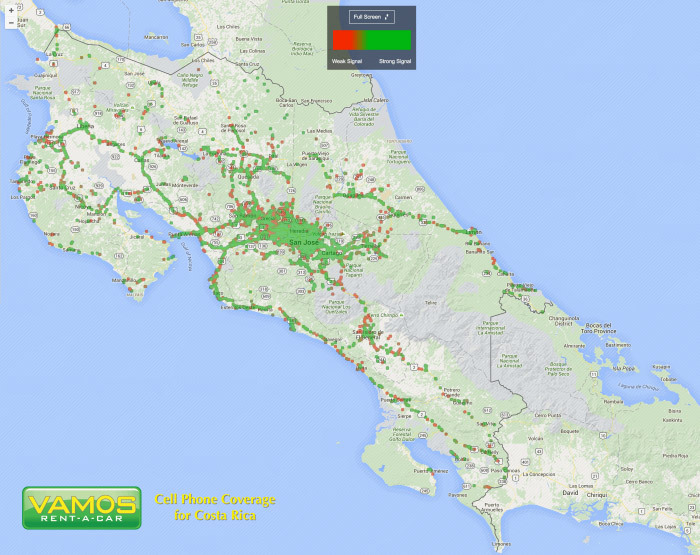 Move aside static GPS, the new tech gizmo in Costa Rica is the real-time, crowd-sourced, Waze. Google-owned Waze boasts in excess of 500,000 registered users in Costa Rica as of April 2016. This global application is proving a vital role in navigating roadways. Our Waze driven GPS device — we like to call it the Wazephone — is driven by a real-time connection to the internet. As such, it delivers five additional benefits. Why use a WazePhone instead of a traditional GPS unit? A GPS chip is a GPS chip. They will all pinpoint the vehicle’s exact location on the map — within a varying degree of accuracy, but the smartphone is much easier to set up, transport, and protect. Having to disengage the GPS unit from the power socket and either hiding it or taking it with you all takes time versus clipping the phone into and out of the holder, and slipping it in your pocket or purse. 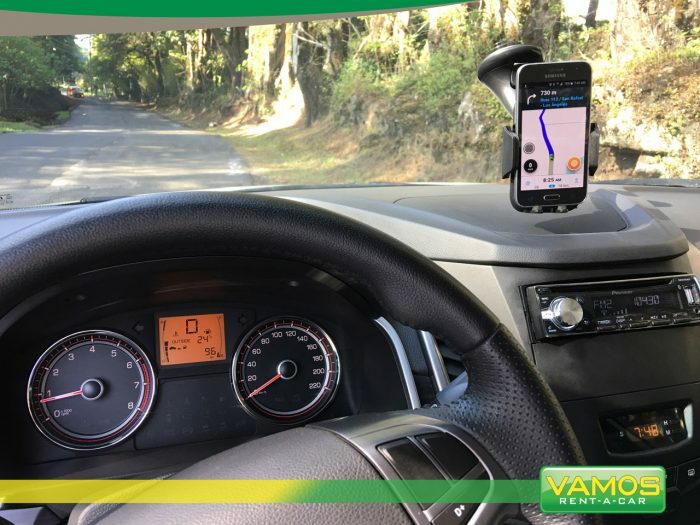 Compiled and regularly updated by volunteers living (and driving) in Costa Rica, the Waze maps are more accurate than any other available online map — unlike GPS software that’s updated every six months (if that). Waze has worked alongside the government through the Connected Citizen Campaign since 2014 to publish information on road closures and other relevant updates. "WazePhone — Ready to Go"
"Clear & Easy Directions with Our WazePhone"
Waze users contribute 24/7 to display accidents, road closures, speed traps, landslides, and other traffic holdups in real-time, enabling users to adapt their route via Waze voice instructions to avoid congestion and delays. Journey times automatically update as road conditions and routes are adjusted, giving the driver a realistic ETA. It’s difficult to make accurate plans when you doesn’t know when you’ll arrive. Don’t miss that tour or spa treatment if you decide to go sight-seeing beforehand. Cattle are notorious for jamming up traffic. 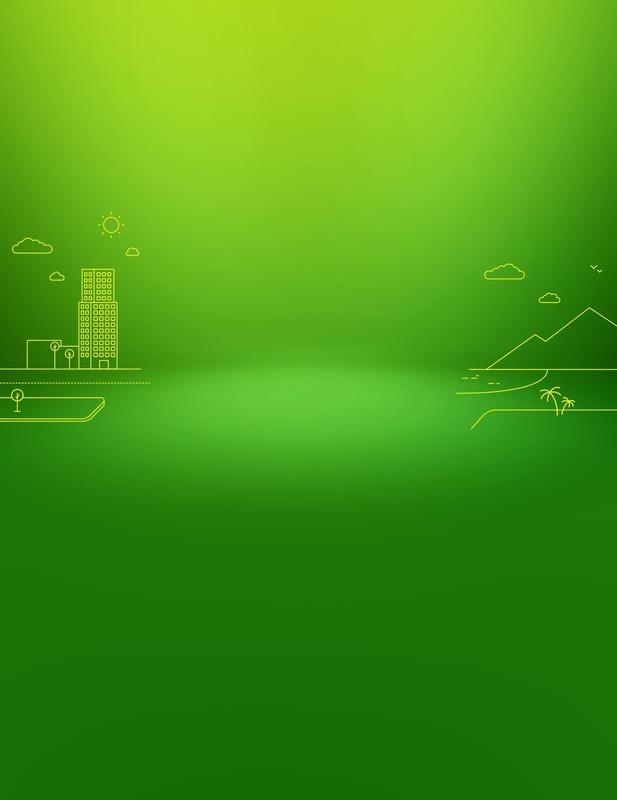 When activated, the Smartphone can provide an internet connection for up to four other devices, allowing passengers to stay connected too — or at least occupied so they won’t ask, "Are we there yet?" 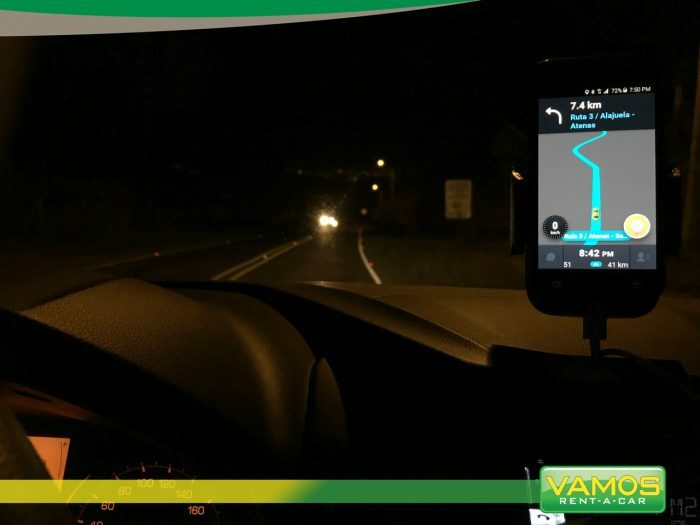 "Night Navigation using Our WazePhone"
With so many advantages to carrying a smartphone, let’s not forget that it also makes calls! Ring ahead to the hotel to confirm arrival time while en route, call us to change your return arrangements, or receive a family call from home; stay in touch with the world easily and cost-effectively. Simply put, Waze is an easy to use, accurate, and timely navigational tool, that also allows calls and tethered internet connections — all in one device! Hold on a Sec...What about Google Maps? And when clear directions are most needed, this is the time when the internet signal fails! Waze stores the route data and therefore continues to guide the user, whether online or not. Granted, the real-time activity is disabled, but the route remains clearly displayed. 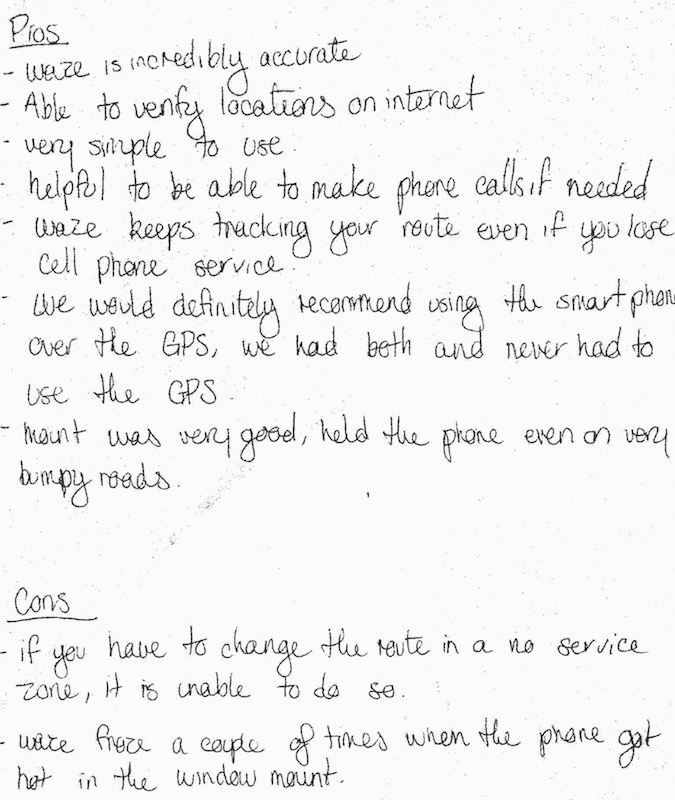 Here’s a snap of one of our customer reviews. She brings up a good point and that is to be aware of the amount of sunlight that’ll be beaming down on the black phone holder and case as this may cause the unit to freeze due to internal temperatures. Like most things in life, it comes down to avoiding pain. If you’re not in any hurry and love seeing the real life of the places you visit, then sure, navigational aids are probably not high on your ‘must have’ list. However, if this is your well-earned vacation from a hectic schedule, then you may want to think about making your trip as easy as possible. 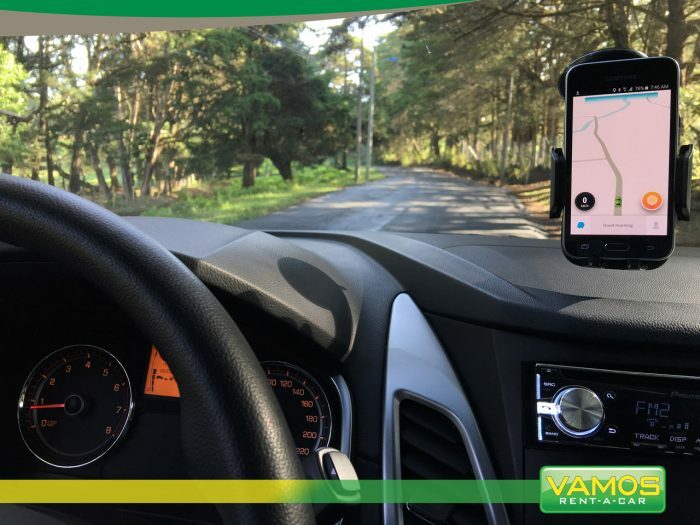 We at Vamos recognize this and that’s why we’ve priced the WazePhone package as economical as we can, to provide exceptional value and service to all our clients. Volume generates our profits, not price gouging. Our units are in short supply, so inquire on how you may reserve a WazePhone along with your vehicle today! There’s also a free resource you may use if you’re reluctant to rent a WazePhone for the reasonable price of $5 per day. YourTravelMap.com offers a route planner with clear Tico directions and far more accurate journey times than Google. Plan your vacation in advance by printing your personal itinerary along with detailed directions and driving times. Following our "keeping it real" mantra, clicking the map below will expand it to a more readable size. You may also download the PDF version of this and print it out if you’d like. Your choice — whatever is easier for you. Reference this with your travel plans and see how the WazePhone will compliment your navigation — making it as stress-free as possible and "Cheaper Than Counseling" as our old ad used to suggest.